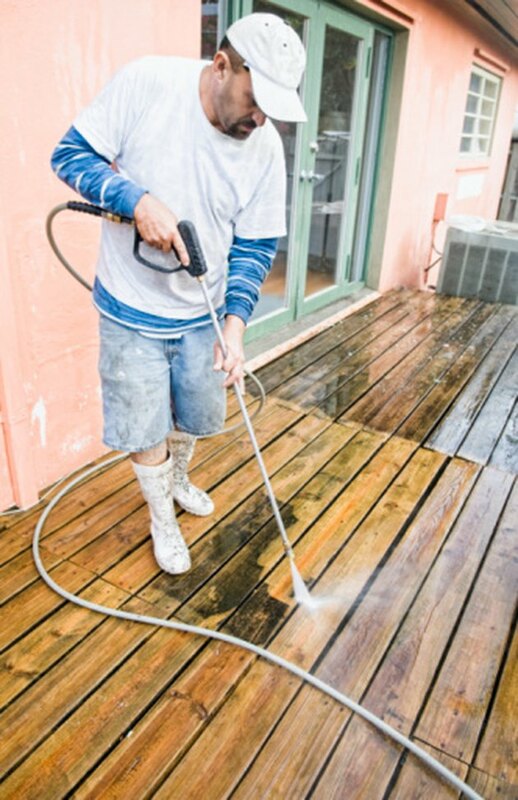 Pressure washers are electric or battery-powered units that spray high speed water from a wand attached to a hose. These power washers are often used for the cleaning of hard surfaces with a wide surface area, such as house siding, porches, and driveways, and are commonly found it car washes. Pressure washers have a lot of parts, which means there are a lot of possible places where the machine can break down. There are some common problems and common fixes for most pressure washers. Pressure washers will not perform properly if clogged or kinked. Make sure the unit is plugged into a working outlet and that the machine switch is in the "On" position if the unit will not start. Reset the circuit breaker to the home if it is switched to the "Off" position and that the switch is rated for the voltage of the machine. Check that the water supply hose plugged into the machine is properly connected and turned on if the machine runs but there is no water coming from the unit. Inspect the nozzle of the pressure washer wand and look for clogs or debris that may prevent the wand from shooting out water. Wash it according to the instructions provided with the machine. Remove the filter of the machine according to your model's instructions and rinse it out with water to remove any debris if the machine has low pressure coming from the wand. Remove the inlet valve from the wand and rinse it out. Flush the hose with water to remove any debris, as well. Check the plungers and packing pieces of the pressure washer if water is leaking from the pump manifold. Replace any worn pieces with the proper replacements ordered from your model's manufacturer.